Realistic sculptures usually do very little for me, particularly those of the political memorial type. On a tour to Honolulu in November 2007 I was confronted with a range of such sculptures. Predictably my first reaction was very much along the lines of my well practiced prejudices. And why not? Usually such statues are used by sections of society to prop up their own histories and their own status. 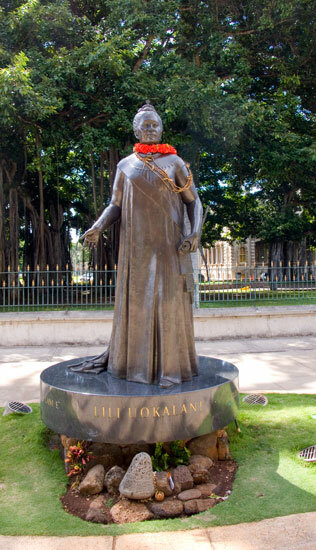 Having said that, the experience of seeing these statues while learning about the complex story of Hawai'i, left me with a heightened respect for the examples scattered around Honolulu. Not that any of them are great art objects - but they are very potent symbols for the local Hawaiian communities. While political statues and memorials are often decorated in jest, within Honolulu I observed that several of the statues were decorated with symbols imbued with deep respect. The statues symbolise something that is very intense amongst the locals which for now remains below the surface. But it did not take much effort to see the layers of evidence of the real emotional views of the century old political situation in this particular state of the United States of America.